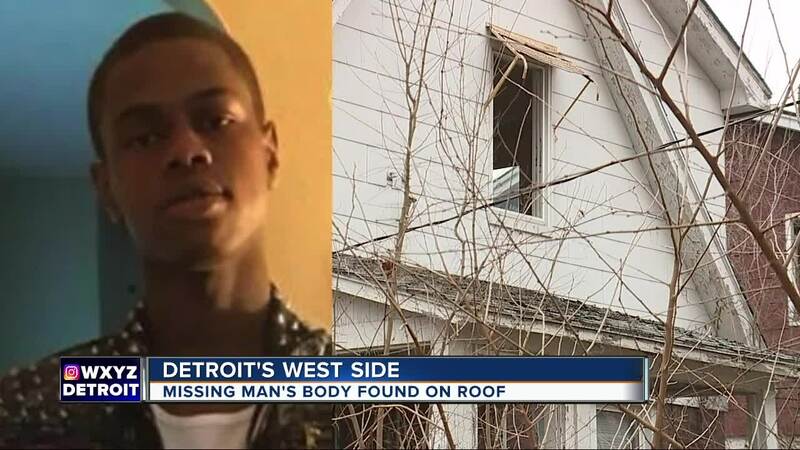 A Detroit man missing for nearly a month was found on the roof of his house, shot to death. It appears he climbed out onto a window after being shot. DETROIT (WXYZ) — Relatives of 20-year-old Drevon Johnson organized a search party Thursday afternoon in hopes of finding clues into his disappearance, but just ten minutes into the search, they found his body on the roof of his home on Lesure near Schaefer and Fenkell on Detroit's west side. Detroit Police and Drevon's relatives are now trying to piece together the last moments of his life. Drevon was last seen by loved ones on December 16, 2018. They searched for him for weeks and then, according to one of Drevon's aunts, a woman who is pregnant with his baby recently told them that she was at the house on December 16 when she heard gunshots. The woman reportedly told Drevon's relatives that she hid in the basement and then called for a friend to come pick her up. Relatives said it appears that after Drevon was shot, he managed to climb out of an upstairs window and land on the roof of the porch. Johnson told 7 Action News that the woman never called police or even notified Drevon's mother who lives just two doors away. Anyone with information on the homicide is urged to call detectives at 313-596-2260. And click on the video to watch Kimberly Craig's report.